The North Myrtle Beach area is truly the epicenter of the golfing world. Amateurs and pro’s come from all over the world to play on one of the 100 plus golf courses on South Carolina’s beach coast. Golf digest chose 10 of our courses as part of the top 100 public courses in the U.S. So, deciding on which courses to play while here can be challenging, but finding North Myrtle Beach golf condo rentals is a breeze. In fact, we here at Grand Strand Resorts make both choosing the courses you want to play and the condo in which you are to stay as easy as a light summer breeze. With over 100 condo rentals to choose from, all uniquely their own, and over 100 golf courses to choose from, you may feel like closing your eyes and randomly pointing to a place on a North Myrtle Beach map. Not a wise idea. 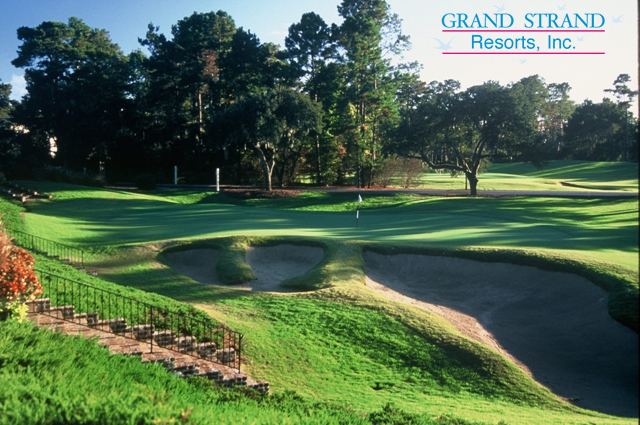 Instead, go for the green by calling Grand Strand Resorts to share with us what kinds of courses you enjoy playing, and what type of condo you are interested in so we can help put together a golf condo rental package that meets your vacation desires and budget as well. 36 golf courses in the North Myrtle Beach area carry at least a 4 star rating, making this area the largest concentration of such highly rated courses anywhere in the world. And if you are to play any of them, you will undoubtedly want to enjoy an appropriate place to stay while here. North Myrtle Beach golf condo rentals includes everything from exclusive condos at the South Shore Villa’s, to the cozy comfort of Willow Bend at Barefoot Condo Rentals. There is something for everyone. Comfort, class, and carefully maintained properties beckon you to spend your golf and beach vacation at one of our destinations.